Have you discovered that Jesus sometimes gets lost in the middle of the hustle and bustle of His birthday party? Would you like to be able to keep your children's focus on Jesus and also join them in the wonder of the celebration? For each of the twenty-four days preceding Christmas, The ADVENTure of Christmas serves as a fun and handy guide that describes the significance behind your favorite traditions. Hanging lights on the house, wrapping gifts, and decorating the tree will become opportunities to share how these customs relate to Jesus' birth. 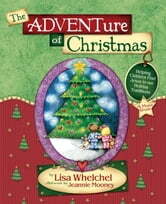 The ADVENTure of Christmas recaptures the true meaning of this beloved season, giving reasons to celebrate for years to come. Feeling like Jesus had gotten lost in the frenzy of the holiday season, I asked the Lord to show me what I could do to teach my children the true meaning of Christmas. I was caught off-guard when He simply replied, "Don’t do anything differently. Look in the middle of the celebration and you will find Me." He was right. There was no need to orchestrate moments to pontificate about "the commercialization of Christmas." Instead, Jesus is beckoning us to come to the party and bring the kids. In doing so, we run into Him at the mall, the movies, even at school. He hides in the lights, the carols, and the cards. He is there when we dress the evergreen tree, when Dad dresses up in a red suit, and even when we eat turkey and dressing! Why Did God Make Pomegranates?